Venezuela and Colombia have begun work on an ambitious $200m (£108m) pipeline project which will see Venezuelan gas and oil reach Central America. It will also speed up the delivery of fuel from the region to East Asia. The presidents of Venezuela, Colombia and Panama witnessed the welding of the first segment of the pipeline in western Venezuela's Zulia state. Venezuelan President Hugo Chavez told reporters the supply line would last for 100 years. Mr Chavez, who controls South America's largest gas reserves, was joined at the launch event by President Alvaro Uribe of Colombia and their Panamanian counterpart Martin Torrijos. Next year Colombia will provide Venezuela's isolated border region with gas. But in seven years' time the flow will be reversed with Panama and Colombia receiving Venezuelan gas. 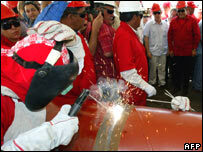 Mr Chavez described the pipeline as a strategically important route linking the Caribbean basin to the Pacific Ocean. Venezuela is likely to extend the pipeline to the Pacific Ocean ports of Colombia and Panama. Mr Chavez wants to pump oil and gas to the Pacific coast so it can then be shipped to East Asia. This would cut transport costs and time to the Asian markets. Energy experts say Venezuela is looking to replace the United States as its number one customer with new partners in Asia because of longstanding diplomatic tensions with Washington.